The deadliest assassin to stand the test of time. From a Producer of Hero and Crouching Tiger, Hidden Dragon comes Blood: The Last Vampire, based on the cult hit anime series. Demons have infested Earth. And only one warrior stands between the dark and the light: Saya, a half-human, half-vampire samurai who preys on those who feast on human blood. 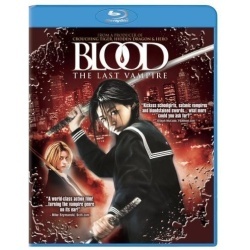 Joining forces with the shadowy society known as the Council, Saya is dispatched to an American military base, where an intense series of swordfights leads her to the deadliest vampire of all. And now after 400 years, Saya's greatest hunt is about to begin.